From the exotic flavors of faraway countries to the comforting classics mom used to make, you’ll find no shortage of dining options in Manchester, Connecticut. Options range from fine dining to budget-friendly to ensure you can always find something to fit any occasion or budget. If you’re not sure where to go next, here are a few of Afford-A-Bail Manchester Bail Bonds’ favorite picks around the city. While it would certainly be a shame to miss this joint’s delicious array of sandwiches, the true star of the show is the all-day breakfast menu. Fluffy, steaming pancakes, luscious stuffed french toast and thin and airy omelets are just a few of the favorites. If you’re feeling brave, order the Marcus Camby. Looking for something out of the ordinary? The chorizo & sweet potato hash is sure to please. Finally, if you just can’t get enough meat in your diet, the meat bonanza is a heavenly pile of pork and potatoes you won’t soon forget. When it comes to good Mexican food, freshness is everything. It doesn’t get any fresher than being prepared right in front of you. Even the meat is grilled while you wait. Best of all, you can customize anything on the menu to make things as spicy, saucy or cheesy as you wish. As a fast casual restaurant, you can expect affordable prices and a laid back atmosphere. Simply walk up to the bar, order what you want and enjoy. Feeling adventurous? The ghost pepper and habanero salsa is sure to wake up your taste buds. Just be sure to upgrade your drink! The American classics—pancakes, hashes, eggs and bacon—at Chez Ben are good. But the best things on the menu are the Canadian-inspired items. First off, the real maple syrup. Dark, heady and a mix of savory and sweet, this amber nectar will spoil you on the typical offerings of the grocery store or neighborhood diner. However, the real hidden gem of the menu is a comfort food from French Canada—the warm, gooey and completely over-the-top dish known as poutine. With rich gravy, crisp fries, melting cheese curds and a variety of extras, it’s like a hug on a plate. When you get a craving for pizza, nothing else will do. Once you’ve bitten into the crispy crust of a Frank Pepe pie, you’ll be hooked. With their fresh local ingredients, signature coal fired ovens and the same recipes created by Frank Pepe himself in 1925, the chain is one of the oldest operating pizzerias in the state. Favorites include the fresh tomato pie, the white claim pie and the simple-yet-delectable margherita pie. You’ll also find a selection of pastas, salads and wines to round out your meal. If you’re looking for a real treat, be sure to order one of their hard root beers. Be prepared to be spoiled by the gourmet burgers and fries of Corey’s. Mixing gourmet preparations, handmade sauces and fresh meats, they take this all-American classic to places you wouldn’t think possible. From the fiery Oh Burger, You Devil to the meaty magnificence of The 7 Burger, you can’t go wrong with anything on the menu. Be sure to try some of the fries as well. The sweet potato with maple mayo are sweet enough to be dessert but with just enough salt to go great with any meal. Looking for a tangy punch? The sea salt n vinegar fries won’t disappoint. 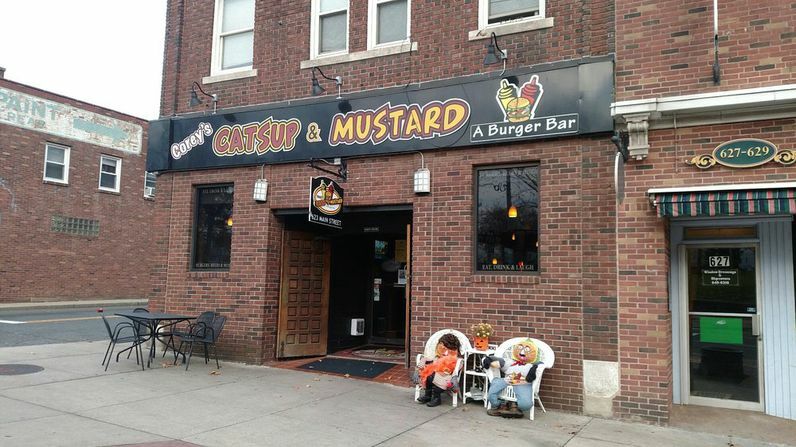 Whether you’re stopping by for a bail bond in Manchester, or enjoying some time with the family around the city, you can always find a great bite to eat nearby if you know where to look. These options are just a sampling of the top eateries in the city. If you want to stay overnight, check out one of these hotels in Manchester! Get out, explore and let us know some of your favorites in the comments below!